I took the metro north train up the Hudson to Tarrytown to get some images of the Tappan Zee bridge (see Iconic New York, Color). It was so picturesque. 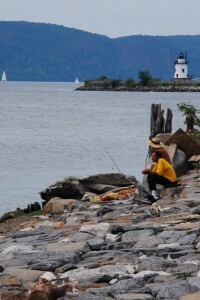 There was a little lighthouse (see People and Places), sailboats, very few people. Until I happened upon these two guys fishing. I think it was the straw hat that made me think of Tom and Huck. 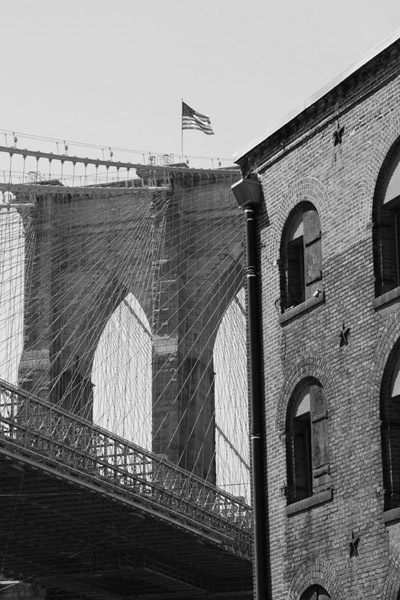 I was in Dumbo for The New York Photo Festival last week. The views from there are great and every time I’m there I see something else. (For all you out-of-towners, Dumbo’s a hot new neighborhood in Brooklyn between the Manhattan and Brooklyn bridges). The shot that’s the home page for my website came from there. Here’s a shot of an abandoned warehouse. Shoot last night with a friend in Times Square. What an experience! I’ve never just stood still there -I’m usually pushing through the crowds to get to the theater. So many people, so many languages being spoken. As a lifelong New Yorker, there was a time when I would have been afraid of being mugged. Now I was afraid of being trampled by the tons of tourists! It definitely gave me a new perspective on the “crossroads of the world”. It was very entertaining and I got some great photos! Welcome to Ellen Goodman Photography! Thank you for visiting my new website. Hope you enjoy the view!